A sketch of a few thoughts on ‘objective’ vs ‘subjective’ and ‘truth’ vs ‘approximation’ in the context of what I’ve been calling ‘model closure‘. Taking a roughly/informally category theory perspective. Includes more discussion of how the data space is idealised/closed as well as the parameter/theory space, as well as issues of invariance, multiple scales, intermediate asymptotics and renormalization. Figure 1: ‘Thinking’ as a process of ‘mirroring’ ‘reality’ (L) and the ‘objective/subjective thinking’ distinction as a further mirroring (essentially via a ‘functor’) of this ‘thinking-reality’ relationship within the ‘thinking’ concept itself (R; both from ‘Conceptual Mathematics’ by Lawvere and Schanuel). 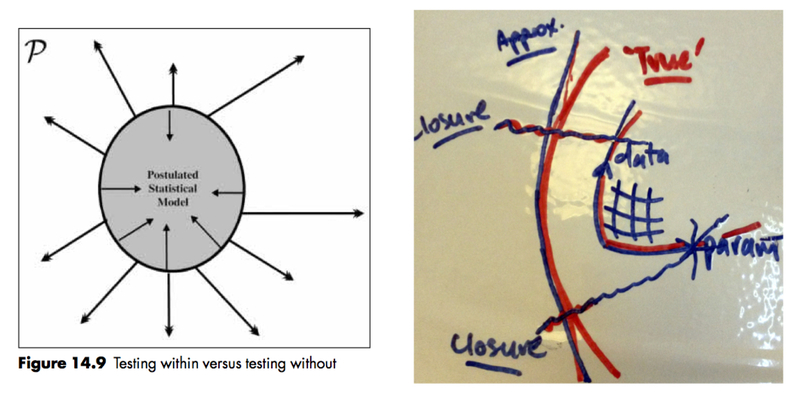 Figure 2: Testing ‘within’ and ‘without’ relative to a model (L; from ‘Probability theory and statistical inference’ by Spanos 1999) and a geometric picture of model closure relative to the ‘truth’ (R; my own drawing). even in ‘model world’ (c.f. the ‘real’ world) we need to distinguish between the ‘objective, external’ world and the ‘subjective, internal’ world. In particular, this distinction is drawn relative to the boundary defining the model closure, and applies to both ‘data’ and ‘parameters’. As I have discussed in other posts, closure is what delinates the boundary between estimating parameters within a model structure and testing the model adequacy with respect to external reality. We have essentially already considered the parameter closure, i.e. discarding ‘irrelevant’ parameters (theoretical constructs). The same idea applies, however, to the data space closure. Some do not distinguish ‘within’ and ‘without’ in the way done here for various reasons – from ‘all models are wrong and therefore subjective’ to leaving ‘lumps of probability‘ to keep the ‘options open’ somewhat. There is some truth in these general ideas; after all, all closures are provisional. I still prefer to explicitly introduce and distinguish ‘inside’ and ‘outside’ a model and ‘objective’ and ‘subjective’ constructs, however – even when both are (and really, can only be) imagined. Figure 3 “Lincoln in Dalivision, Salvador Dali Lincoln in Dalivision Print, Lincoln in Dalivision”. One (relatively) small scale depicts ‘Gala’ gazing at the sea, which in turn ‘merges into’, at an ‘intermediate’ scale, a portrait of Abraham Lincoln. The ‘frame’ of the full painting ends our ‘boundary of interest’. If we stand much much further back, we no longer recognise any interesting features – our ‘largest’ observation scale determines the largest scale features we wish to perceive. Related to the (applied mathematics) concepts of intermediate asymptotics and renormalization scaling is another set of concepts that I will (loosely) draw on below – the (thermodynamic) concepts of ‘external variables’, ‘internal variables’ and ‘internal coordinates’. Roughly speaking, the external variables determine the overall ‘shape’ of the closure as determined by ‘background’ conditions and connect our invariant theories (see next) to external measurements, the internal variables are intermediate variables that form (approximately, at least) an invariant and predictively complete set for a (scale-free) phenomenon of interest, while the internal coordinates index a finer set of internal degrees of freedom. In general the internal variables are determined from integrals over internal degrees of freedom/internal coordinates. So we have (at least) three scales – ‘external’, ‘intermediate’ and ‘small’. This enables us [or will eventually] to compare theories that are a priori distinct, e.g. have different parameter domains and definitions, but seem similar when looked at in the right way. That is, it may be possible to find a common, scale-free predictive theory with a (relatively) invariant set of internal variables that serve as a common target mapping for the variables of distinct theories to enable consistent comparison. To connect back to reality requires ‘boundary closures’ on ‘either side’ of the intermediate, invariant theory – i.e. data space closure via a notion of measurement and parameter space closure via a notion of stability under manipulation/variation in other degrees of freedom (and relates to the formulation of priors). ‘causality’ and ‘mechanistic’ understanding are about invariant structures under the scales and controls of interest; probability enters into consideration in a somewhat secondary manner: to capture uncertainty within and between structural relationships, and in determining the resolution of control and measurement accuracy. 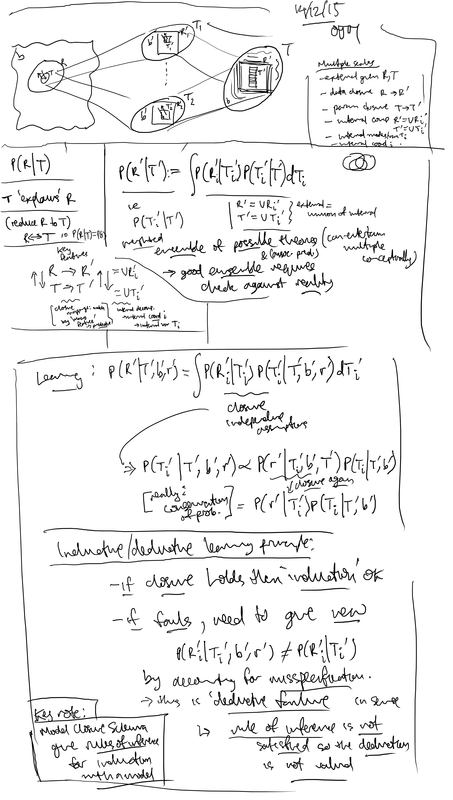 For now, here are some (very quickly sketched) handwritten notes. Besides properly tidying these ideas up, I also want to connect them to Laurie Davies’ ‘Approximate models‘ approach. This entry was posted in Uncategorized on October 13, 2015 by omaclaren.